After reached back in Kerala hurriedly, I now had to head to Hyderabad! Train was ruled out since I had to be there in the morning and not after noon. I had the option of Kallada, Kesineni or KPN. Decided to try out Kesineni, since I have tried both the other operators. I booked at their office in Ernakulam. The fare was Rs. 1600, and my seat number was 14. I chose Kadavanthra as my boarding point (Vyttila was better – I somehow selected Kadavanthra). I was already running late for my bus. Ernakulam is close to 2 hours by bus, and I was still at home! I hurried out of home at 11:35hrs, and luckily got a bus to Kodungallur (3.5kms away) quickly. I reached Kodungallur around 1155hrs, and prepared to head to Ernakulam in the first bus that turns up. 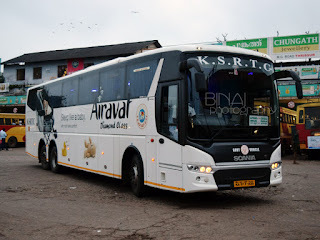 The first bus to come in was “Hyder” – a fast passenger bus running on Guruvayur-Ernakulam (Vyttila) route. I was traveling in a private bus on that route for the very first time! The bus left Kodungallur at 1200hrs – there was a KSRTC right behind, which I saw only after my bus left the stop! This bus dropped me at Vyttila (Ernakulam) at 1300hrs. After a bit of bus-spotting at Vyttila, I decided to take a rickshaw to the pick-up point of my bus to Hyderabad. I took a pre-paid auto from the bus station. The pre-paid autos in Kochi are different – you pay only Re. 1 at the counter, who would issue a printed receipt with the destination and fare to be paid. The rickshaw driver would collect only the amount mentioned on the receipt – not a single penny more. On the way to my pick-up point, I saw my bus parked at a fuel station. It was being cleaned. I was dropped at the pick-up point at around 1330hrs (the mentioned reporting time). Kesineni doesn’t have any waiting facility there – but the place has a lot of trees for shade (better than Vyttila). Parveen’s Mercedes Benz and Corona were parked there, along with a couple of non-AC buses of Sharma. My bus – AP-31-TB-6868 – was brought in at 1342hrs. The bus just turned around and was ready for pick-up. The bus had two drivers (both in uniform), a cleaner (also in uniform) and a guy from their Kochi office. This guy checked tickets. The cleaner helped passengers to leave their luggage in the boot. The bus was very clean – both inside and outside. The seats had leather/canvas upholstery instead of fabric. The bus was delivered in November-2011 end (according to the PDI sticker on the windshield), and had run about 1.25lakh kms. About 5 passengers got in at the starting point itself. We started off exactly at 1345hrs. The road from Kadavanthra to Vyttila was unusually empty that day – what ends up taking 20 minutes was covered in 13 minutes. We were at Vyttila exactly at 1358hrs (Schedule time is 1400hrs). Four more pax got in here. We started at 1405hrs. The driver was not very fast. The second driver was trying his best to sleep – and hence no movie/music was played. A female passenger sitting right behind the spare driver was shouting out at the top of her voice over the phone – the cleaner came behind and politely asked her to talk lowly or just ‘shut up’. By now, we were stuck in the awful traffic snarls around Edappally. Ernakulam bypass is now the busiest road in the city – the city roads are better than the national highway! We picked up another passenger from Aluva at 1434hrs. The driver maintained a stead speed of about 80kmph all the time – lots of cars and other buses overtook us with ease. But the driving never seemed dangerous – the speed was consistent. We kept this speed all the way to Paliekkara toll booth (the controversial toll gate on NH-47 between Edappally and Mannuthy). He did reach 85kmph at times, but the occasions were far and few. I was busy reading a book all the while. A while past the last flyover on the 4-laned portion of the highway, a speed checking squad caught our bus for over speeding! All the while our driver was cautious not to over speed, and we were caught the moment our driver hit 90kmph! The driver paid the penalty, and decided not to be a good citizen anymore. We reached Mannuthy at 1538, and left after picking up a passenger. Traffic after Mannuthy was awful – the bus did not go above 60kmph any time. The bus crawled big time as we neared Vadakkenchery. After crawling for most of the time, we reached Palakkad at 1652hrs. Three passengers got in here, and we left at 1654hrs. The second driver got up now – unable to bear the repeated bombardment from the cell-phone wielding lady. The second driver had some problem with an inspector at the TN Outgoing checkpost over payment of road tax, and now he was ready to finish off the problem. There was a very heavy traffic block at Walayar check post. The bus did not move even a bit for quite some time – the second driver got off and tried controlling the driver. After all the drama, our bus managed to wriggle out of the block and we entered TN. The bus stopped for a while at the RTO Checkpost at KK Chavadi for a while. We stopped for a tea break just after Neelambur Toll gate (on Coimbatore bypass) at 1821hrs. It was a small bakery there – no toilets or other facilities for passengers. During the break at Neelambur, Coimbatore Bypass. This break was fairly long. Had a small chat with the drivers at this time – they said that the route has stabilized now. They get 20-30passengers on an average per day. 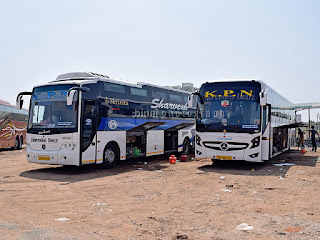 He was mentioning that Kallada was also doing really well on that route – they too were getting fairly the same number of passenger as Kesineni, while KPN was doing very badly on that route. In the meantime, a minibus carrying the passengers boarding from Coimbatore came in. We were all asked to get in first. The cleaner took a head count, and then started boarding of passengers from Coimbatore. We started off at 1854 hrs, with 15 additional passengers. We now had 29 passengers on board – not bad for a working day! The second driver was now in charge. Once all the passengers settled down, they played a movie on the Entertainment system. The movie was played from a portable drive, not a DVD or a VCD. The bus went inside Chitode to pick up one passenger (2024hrs). The second driver was not very fast as well, but still maintained very decent speeds. The first driver got off at Bhavani – now it was just one driver and one cleaner. The first guy said that a relief driver will get in at Salem. We stopped at Hotel Saravana Bhavan, near Sankari bypass at 2056, for Dinner. This hotel was opened only recently – they serve some really good vegetarian food. We left after dinner at 2125hrs. The movie got over sometime after we started from the hotel. We stopped at Salem, near the new bus station, at 2156. About 6 passengers got in here. We resumed our journey at 2201hrs. This was the last pickup point for the bus – we had a total of 36 passengers now! A good portion of the passengers seemed like traders, who were returning to Hyderabad after business. The typical techie/family crowd that is seen in Bangalore buses was absent – the passenger profile was totally different in this one. 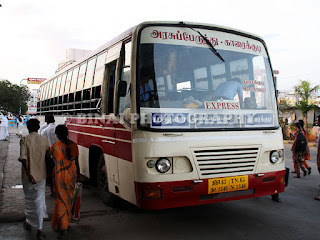 The bus waited outside Salem town (near the Toll Gate) for a long time for the second driver – but no one turned out. The driver was making some phone calls, but there was no resolution. I slept off after some time. I vaguely remember seeing Krishnagiri (around 2355hrs). 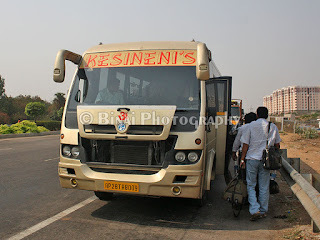 From Krishnagiri, the bus got into a two-lane highway towards Madanappalle. I remember seeing a Checkpost at Palmaner. The ride was not great on this route – the road was bumpy, and there was heavy traffic. I woke up at around 0430, when the bus pulled in for a tea break at a Bakery near Dharmavaram. The Trivandrum-Hyderabad bus was parked there already – the bus left immediately after our bus stopped. 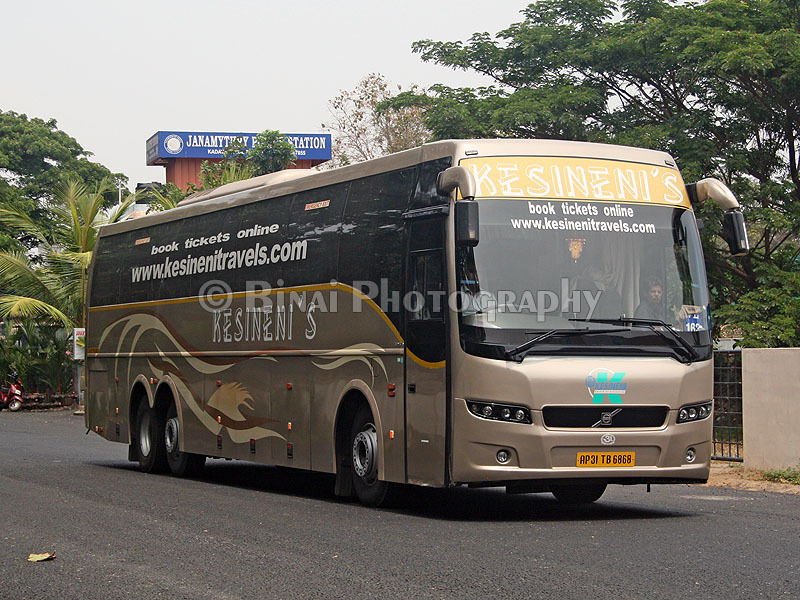 Another Kesineni B7R passed through without stopping as well. The break was upto 0443 – I came to know at this point that the relief driver did not join in, and the second guy (who took over at Coimbatore bypass) would be driving all the way to Hyderabad! The bus turned towards Anantapur from here, and joined the four-laned highway outside Anantapur. One passenger got off here. The driver now meant business, and he was maintaining three digit speeds for quite some time. I slept off again. I woke up again sometime around 0630 – we were still running, on the four-lane highway. The bus stopped to drop some passengers, at around 0644. Just as the bus got moving, I saw some boards and realized that we were only at Kurnool then! The driver clipped really well after Kurnool (speeds in the range of 105kmph). I slept intermittently throughout the journey. Most passengers in the bus were fast asleep. We reached Shamshabad at 0904hrs – now I was sure that I wouldn’t be reaching my destination at the fixed time. 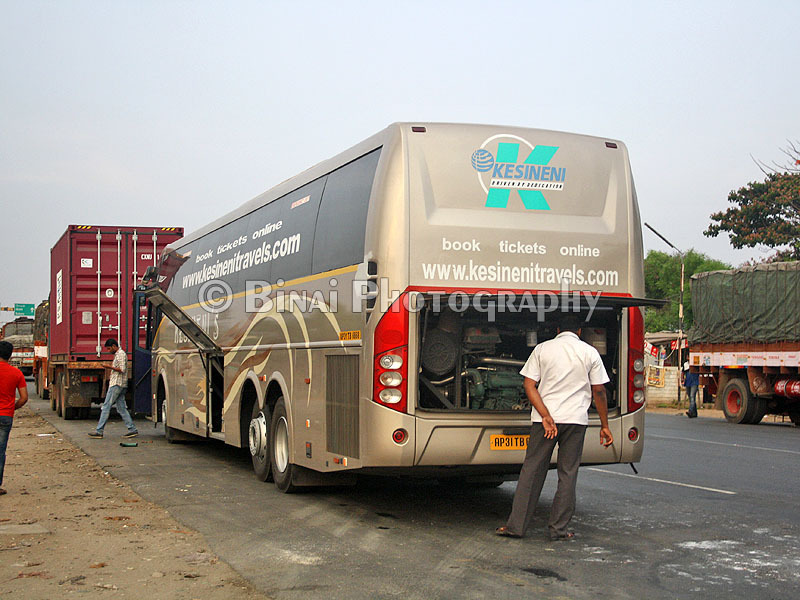 The bus turned off the national highway and entered the Outer Ring Road. It was bliss after this – the driver maintained 105~110kmph all the time on the ring road. Some speed limit boards kept on the road clarified that the speed limit on this road was 120kmph! Our bus overtook quite a lot of sedan with ease – we had an Aeroexpress bus also for competition. By now, the driver was getting calls one after the other – he picked up a call and shouted back that a single driver cannot get the bus on time to the destination. The bus exited the ring road at the Gachibowli exit. The bus stopped at the end of the exit road, near a Flyover in Gachibowli, at 0920hrs. Passengers towards Mehdipatnam, Lakdi-ka-pul etc were asked to get into their pick-up bus from there on. The pick-up bus, AP-28-TA-8009, was airconditioned. It was built by MG-Alma – I couldn’t find out which chassis it was based on. It was surely not a TATA or a Leyland. Sounded like a Force motors product to me. Almost 90% of the bus emptied at this point, and everyone moved to this pick-up van. The vehicle started at 0926hrs. It traveled through the core parts of the city – crowded roads, with lots of vehicles around. We passed through Mehdipatnam, and crawled into Lakdi-ka-pul at 0955hrs. I got off here, and headed to a nearby hotel. I eventually reached my destination at 1200hrs (my scheduled appointment was 0930hrs!). The bus was maintained in really good shape – the bus clocks around 1100~1200 kms each day, and is abused very badly by the drivers in their attempt to make it to the destination on time. This journey was my longest in a bus – 19 hours and 35 minutes! My previous longest was 18hours – in a KaSRTC Airavat bus (Bangalore to CBD Belapur in Navi Mumbai). The semi-sleeper seats made my journey more comfortable this time. The crew was well behaved – all of them spoke Tamil, Telugu and a bit of English. No water bottle was distributed to passengers. Blankets were provided though. For Rs. 1600, it was paisa vasool – despite the delay, the bus was still more than 4 hours faster than the train. The single driver part was a bit dangerous – especially given the fact that he had hardly any rest at Ernakulam, or in the bus. Kesineni seriously needs to ensure that two drivers are on board for such long routes. What was the scheduled arrival time at HYB? But the fastest is KAllada they will reach by 17 hours if the conditions are good. And bus is also fast like they will go 130+.